I'll start today's post with a heartfelt ode to a courageous woman - someone I know and continue to admire every day. Someone who left her country and sacrificed a flourishing career in teaching just so she could be with her man. Someone who understands motherhood and the challenges that comes along. Someone who always puts family before herself. I wish I could go on and on about Sadhna, and how she has changed me for the better. She is not just a life partner but my entire existence. It hasn't particularly been easy for her to give up everything just like that. There were days when I'd return from work only to find her reeling in pain. It wasn't her struggle with the children that bothered me the most, but the loneliness that had started to build inside her slowly. Sometimes she would talk about getting back to her feet again but then drop the idea altogether looking at our 2-year-old daughter Saanvi. Her story seems no different to me than the several others we hear often - of hapless educated women in our country who end up leaving the workforce permanently, depriving themselves of a fulfilling career and in turn the financial independence that comes along with it. 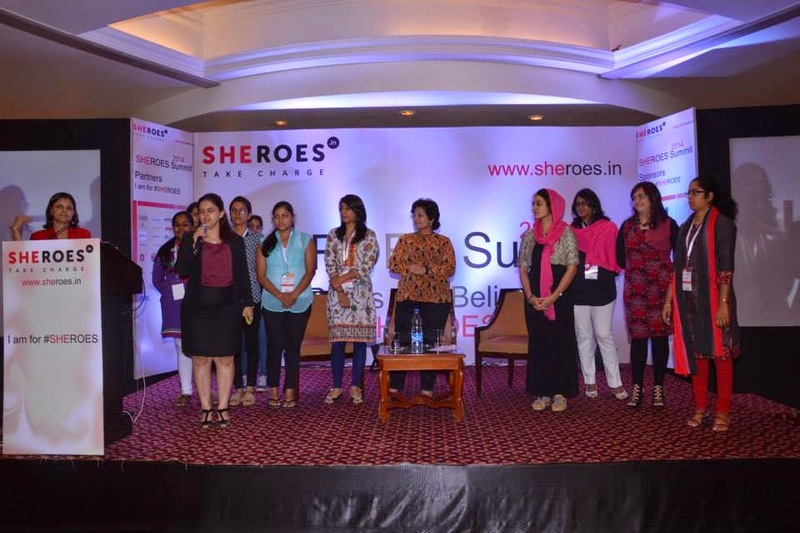 To bridge this gap and empower women like Sadhna in general, Sairee Chahal started Sheroes in January this year. The idea is to build a community of working women and connecting them to mentors and other resources. So who exactly is a Shero? Every woman who makes a choice and makes it work for her is a Shero. 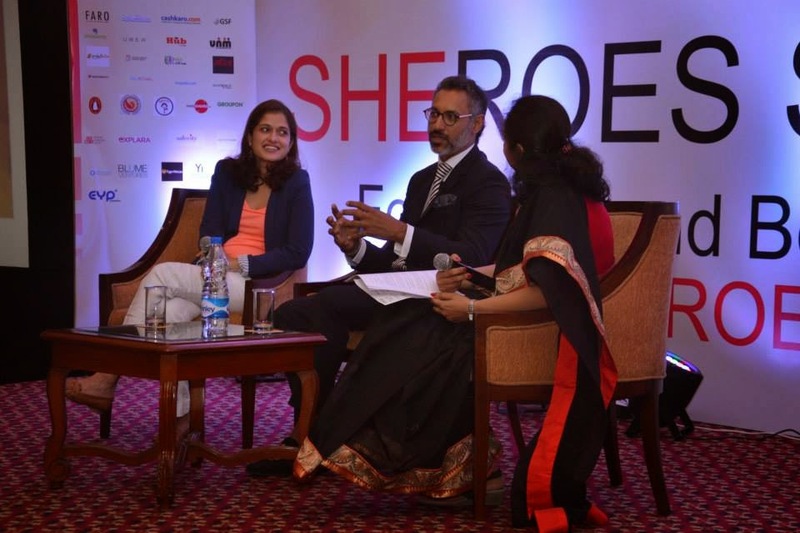 Thanks to Sheroes, women seeking a career now have a platform to voice their concerns openly. 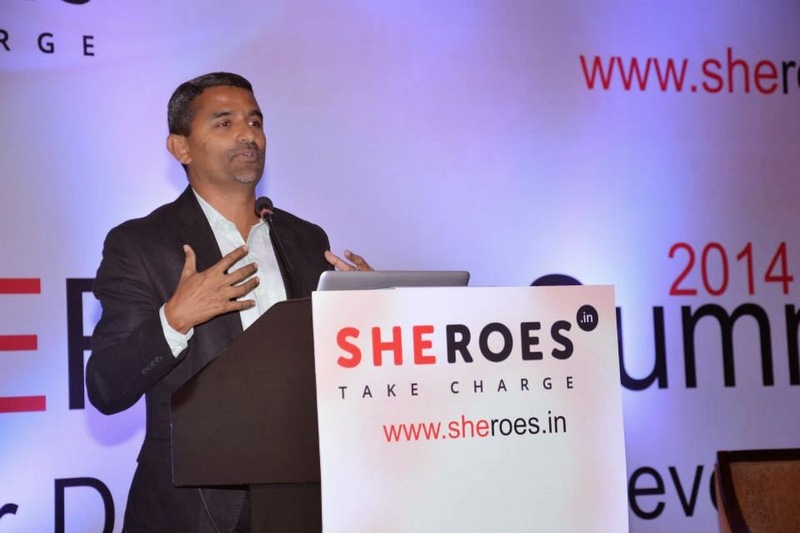 In fact Sheroes has become a gateway to the finest opportunities, resources, and conversations for women especially, promoting work from home job options. Perfect for a work-life balance! I was in awe of Sairee ever since I heard her speak on Diversity and Inclusion at my office on International Women's Day. 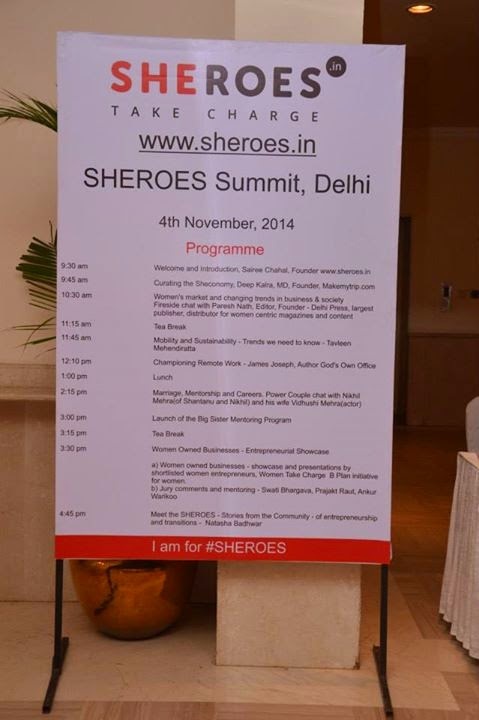 It was during her speech only that I got to know about the Sheroes Summit 2014. 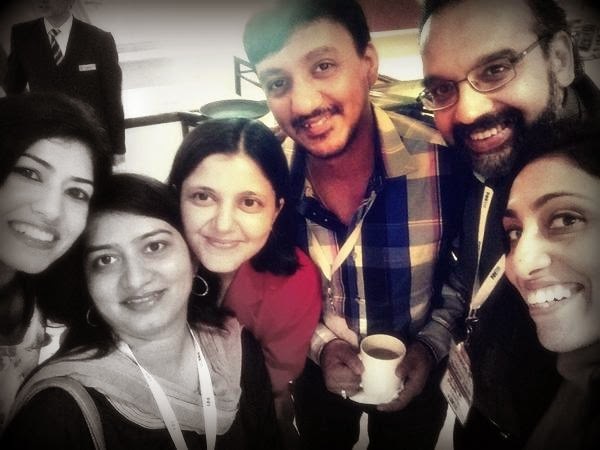 By a stroke of luck, I received a bloggers invite (courtesy: BlogAdda) to cover Sheroes this year - India's largest opportunity scape for women. 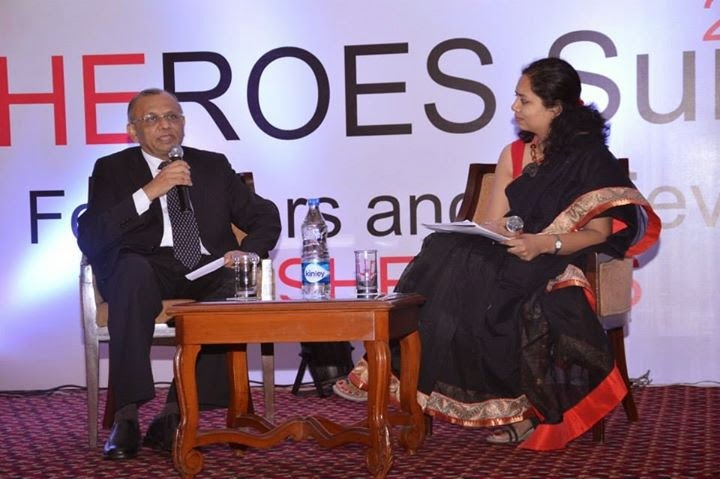 The event was held at The Suryaa Hotel New Delhi on November 4, 2014. After a quick welcome and introduction by Sairee, came the keynote session by Deep Kalra, MD, Founder, Makemytrip.com. 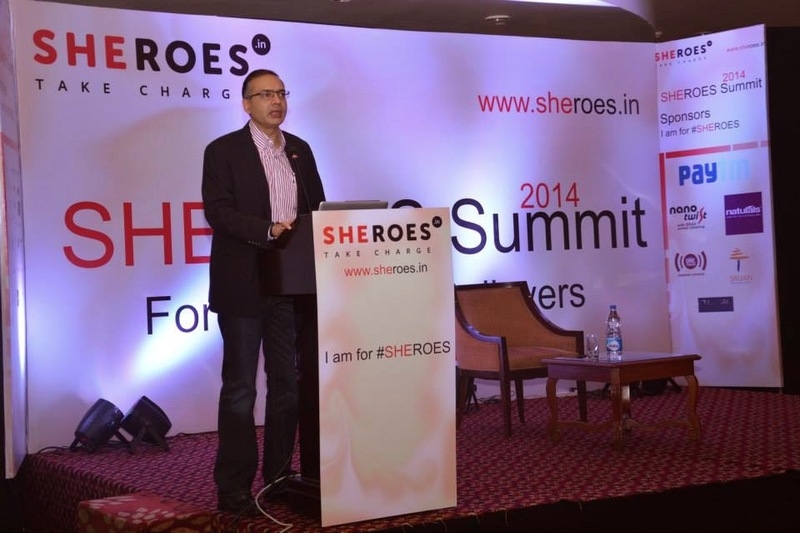 [Deep Kalra is the Founder of India's leading online travel company, MakeMyTrip.com. Launched in India in 2005, MakeMyTrip offered the convenience of online transactions coupled with great value prices, revolutionizing the way Indians research and purchase travel services. MakeMyTrip is today the largest e-commerce business in the country. Having steered the MakeMyTrip business as CEO since its inception in 2000, Deep took on the role of Group CEO in August 2013, to focus on Strategy, M&A and international businesses. Deep continues to lead the Group's strategic developments and overall execution excellence. Deep has been associated with TiE (The Indus Entrepreneurs) Delhi Board since 2007 and took over as the President in January 2013. He served on the NASSCOM Executive Council from 2010-2013. He is also an active Angel Investor in the Internet space. MakeMyTrip was founded in 2005. However, it took 8 years for the company to be something meaningful. The game changer now is technology. Two events that changed travel forever: 9/11 and the dotcom bust. When venture capitalists threatened to back out of the business back then, MakeMyTrip had a choice to close up shop or sustain heavy losses. Deep chose the latter - the best decision of his working life to date. Every entrepreneur needs to ask himself: do you really believe in your business? He took zero salary for 18 months, the same time when 18 out of 42 employees in his company had tendered their resignation. Three years ago, two major airlines decided to sever ties with MakeMyTrip. MakeMyTrip made a dream debut on NASDAQ in 2010. Deep's mantra to success: take the plunge and stay on course. For MakeMyTrip's NRI offering, there were lookers but no bookers. After the entry of low-cost carriers and low fares and the opening of Indian railways website, MakeMyTrip got the first-mover advantage. He urges all, including womenfolk, to put your doubts on the table. He took the plunge at 30. Yesterday's 30 is today's 20. Self-evaluation: No one knows you better than you OR No one knows me better than me. Play to people's strengths. Everyone has an X-factor. Everyone cannot be a pinch hitter or a slogger. There is a reason why Dhoni is such a good match winner, especially during the death/slog overs. The best entrepreneurs in the world never work for anyone. It takes two dots to make a line; you need resilience and gut, but most importantly you need to be stubborn. For every new venture, you need a confidant and a mentor who can steer the business in the right direction. Bring disruptive ideas to the market. Hire someone who is better than you; don't hire a mini-me. Hire someone who questions you, competes with you, and most importantly, disagrees with you when you're wrong. It's right to be wrong. Your best friend at workplace is the one who irritates you the most. Evolution of the team: A team with all-rounders versus a team with specialists. Innovate all the time or perish (Case in point: 4 million MakeMyTrip apps downloaded to date). Encourage risk-taking by hiring Young Turks. Choose guys with spark - spot them and take risk. Company believes in sharing wealth (70% are covered under employee stock ownership plans (ESOPs)). Concept of egalitarian or equal is encouraged within the company. Transparency + Accessibility = Trust. Obsession on customer, not competition. Back your instincts with Analytics. Measure week to week - Excel is all you need to master. 1000 Home Experts in 8 Cities: For the most part, these experts work from home and are required to report at office for a week only. They earn 27k INR per month on an average; the best can even earn up to 1 lakh INR per month). Reiterated what Jeff Bezos once said: Work hard, have fun, and create history. Two out of three is not an option. Transition from an order taker to an order maker. The next session was a tête-à-tête with Paresh Nath, Editor, Founder - Delhi Press, largest publisher, distributor for women centric magazines and content. [Paresh Nath is Editor and Publisher of Delhi Press magazines. Delhi Press, a media conglomerate, has always been proactive in catering to new and emerging market segments with special focus on the needs and aspirations of young people. Paresh started his mission with the group at only 22 years of age and has seen the group rise to a leading publishing house in India with 36 magazines spread over 10 languages commanding a readership of over 30 million. Among the highly respected titles are Grihshobha, Caravan, Sarita, Saras Salil, Women’s Era, Alive, Mukta, Suman Saurab, and Champak. Besides his editorial accomplishments, he is associated with many social organizations in various capacities. He served as President of the Delhi Junior Chamber in 1978. He is Trustee of Indraprastha Education Society and Hindu College Education Society. On the professional front, he is the Founder President of Association of Indian Magazines (AIM). He is President of Indian Languages Newspapers Association (ILNA) since 2009 and served for two years as Deputy President of Indian Newspapers Society (INS). He also served as Chairman of the Media Research Users Council (MRUC) for two years. What promised to be a fireside chat turned out to be a bit of a damp squib. Nath's opinions about Indian women were dated and smacked of hypocrisy to say the least. And you'd seriously expect us to read magazines like Women's Era, Grihshobha, Caravan, etc. after this? No effing way! We are a nation of "illiterate" educated. 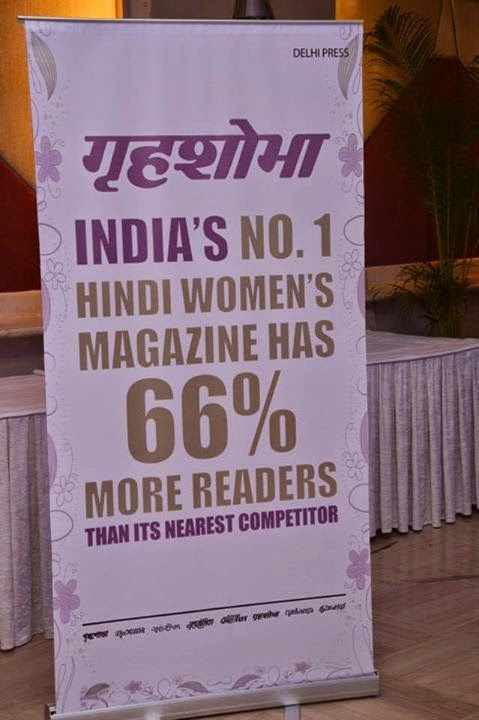 Delhi Press is primarily an editor's magazine <sigh!>. The next session by Tavleen Mehendiratta, co-founder i-mobility.org, brought the audience back to its feet and infused some energy back into the event. [Tavleen Mehendiratta has a Bachelor in Engineering (Hons) from Brighton University, UK with Professor Morgan Heikal Student of the Year Award. Working as an auto journalist for 2 years, she interviewed head honchos of the auto industry until she started looking at the sustainability side of things. Intrigued by how the cities were evolving, pollution was contesting to set new records and the cities were bursting at seams, her career started to make a transition from motoring journalism to sustainable urbanization. She started to look at how the world was looking at smart cities, smart mobility systems, smart energy as answer to challenges of massive urbanization, energy security and formation of mega cities, thus she co-founded i-mobility.org. She's also worked with Mahindra Electric Vehicles as an evangelist and her speech on her journey of interviewing experts and naysayers of electric vehicles, at the launch floor of their electric car was much appreciated by Anand Mahindra. At Mahindra Electric Vehicles, she was primarily in the virtual ownership team; her profile was uniquely placed in the company where she looked at the changes in vehicle ownership patterns, rise of car sharing and its impact and also worked with a leading brand consultant to work out a strategy to identify the electric car’s target audience through ride sharing communities. As a passionate individual, she contributed to Group Strategy Office on future of mobility under their overarching theme of ‘sustainable urbanization’. Currently her focus is on targeting the bottom of the pyramid that means the citizens of these smart cities; she engages with students on issues that are of grave importance like urbanization, internet of mobility, smart policies, smart cities etc. She's also given an inspiring talk to students of 'Masters in Business Economy (MBE)' of the prestigious Delhi University, South Campus on 'smart cities and smart policies' and has been a speaker at the IEEE meet 2014 and a guest speaker at the Birla Institute, Pilani on 'engineering cities of tomorrow'. i-Mobility.org is shortly launching short-term courses for students on 'Smart Cities and Mobility 2.0' and 'Smart Energy and Policies 2.0' for educational significance; the courses already have the Govt. of India approval (VSkills). It has inputs from organizations like Bosch, Tech Mahindra, EBTC etc. and universities like MIT (Dr. Ryan Chin, Carlo Ratti), Tufts, Leeds and more. The courses will be ideally suited for professionals working in energy and mobility companies and consultancies, also for students studying engineering, economy, social entrepreneurship and environment. A day in jam = 70 lakh man hours lost. 20 lakh cars ply on Delhi roads daily. 1200 new cars keep adding to the mess every day. Delhi is by far the most stressful city for parking. The big question is: Are you driving to work or working to drive? 13-day traffic jam in Beijing. Is Delhi next to follow? Air Pollution Masks business in India: No takers yet but a strong need is anticipated. Roads are a shared space but often abused. The solution could be Nanolution, that is, the power of compact and smart. This session from James Joseph, author of God's Own Office, was an instant hit with women - most of whom either took a sabbatical or left their job completely after marriage or children. [James Joseph is the founder of JackFruit365™ - an initiative to create an organized market for Indian Jackfruits in India, 80 percent of which is reported to be wasted every year and to create an engine to support free midday meal program for poor children at school. James has over 20 years of Sales and Marketing experience in North America, Europe and India with globally reputed organizations like Microsoft, 3M, and Ford. In his last role as the Director, Executive Engagement at Microsoft India, he was responsible for strengthening Microsoft's relationship with the senior executives of top 200 enterprises in India and he managed this role from his home office in a village in Kerala. Prior to this role, James was responsible for the manufacturing industry marketing for Microsoft UK. Before joining Microsoft, he held business development, sales and marketing positions at 3M, Ford Motor Company, i2 Technologies and Informatica. James is a recipient of several awards including Circle of Excellence, the highest award for Sales and Marketing employees across the world at Microsoft, Start-Up Entrepreneur of the Year at TiEcon Kerala 2013, New Age ICON d' YOUTH Kerala 2011, etc. In addition, James serves as a mentor for the Startup Village in Kochi. During his work across three continents James had the rare opportunity to design signature dining experiences for his clients with several internationally renowned Chefs which helped him to develop JackFruit365™. James is also an author and his first book "God's Own Office" will is published by Penguin Books in October 2014. James is a recipient of the Highest Professional Performance Award from Steven Anthony "Steve" Ballmer, the ex CEO of Microsoft. Don't be a 'Frog in the well' or a 'Kue ka mendak'. Stay away from pushy people. Was forced into believing that he possessed the remote control to "red light" button. Post lunch, we were invited to be part of a Power Couple chat with Nikhil Mehra and Vidushi Mehra. [A former banker with ABN AMRO Bank and American Express and GE Capital, Vidushi also holds an MBA in marketing and finance. She is a musician, theatre artist, film actor and entrepreneur. Vidushi Mehra is a multi faceted, dynamic performer, she has performed in over 45 productions on stage and has also forayed into Hindi films. She is a mother to 7-year-old twins. You cannot attach a monetary value to happiness. From the age of 10, Nikhil knew exactly what he wanted to become (he even ripped his jeans apart in front of his father). Many modern-day marriages break up because both husband and wife demand a fulfilling career yet no one is willing to compromise. Their marriage works because of simplicity, pure intent, love, and respect for each other. They are also great friends first. Important to remain who you are after marriage. Marriage isn't nearly as simple and requires patience and practice. Any time you think of giving up, look at your children first. Give up a project if it doesn't raise you to its highest bar. When in conflict, let go of the ego. There can only be one Diva or Superstar in the family. Couples should not discard who is earning more. Children don't differentiate between mother and father, and they shouldn't. New age parenting is different due to technology. Earlier women did not allow men to participate in raising kids. But now their expectations have risen. Couples are getting married for all the wrong reasons. Worst, they are having children for all the wrong reasons. Don't be let down by your own insecurities. Fix the problem, don't aggravate it. Get away from the self-inflicted pain. Don't feel let down, let go instead! Sairee unveiled the Big Sister Mentoring Program, which essentially acts like a conduit between mentors and mentees. Your relation with yourself is far more important than your relation with others. Holistic pregnancy: Joy in the womb, joy in the world. 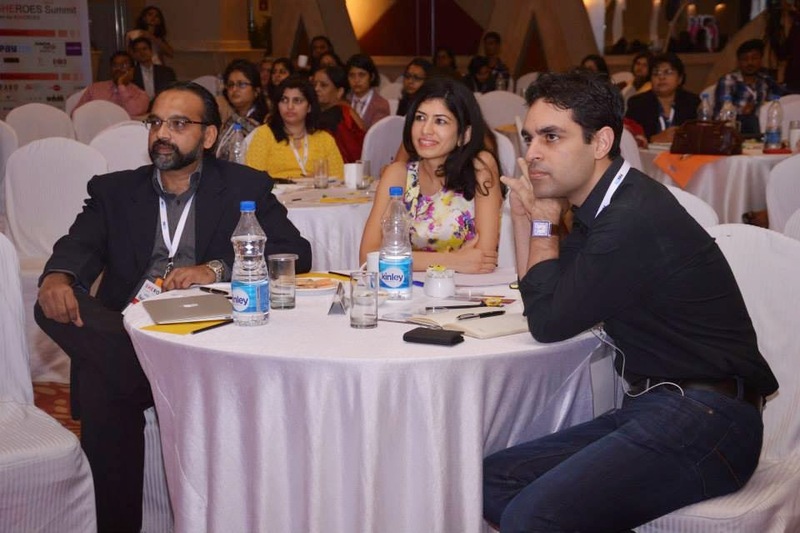 The penultimate session allowed women-owned businesses to showcase and present their entrepreneurial ideas to a three-member jury comprising Prajakt Raut, Swati Bhargava, and Ankur Warikoo. 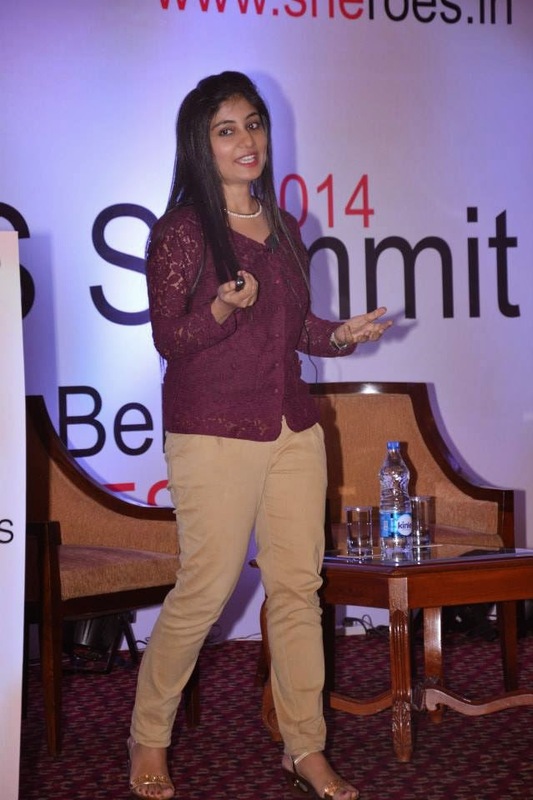 [Prajakt Raut is an entrepreneur and entrepreneurship evangelist. 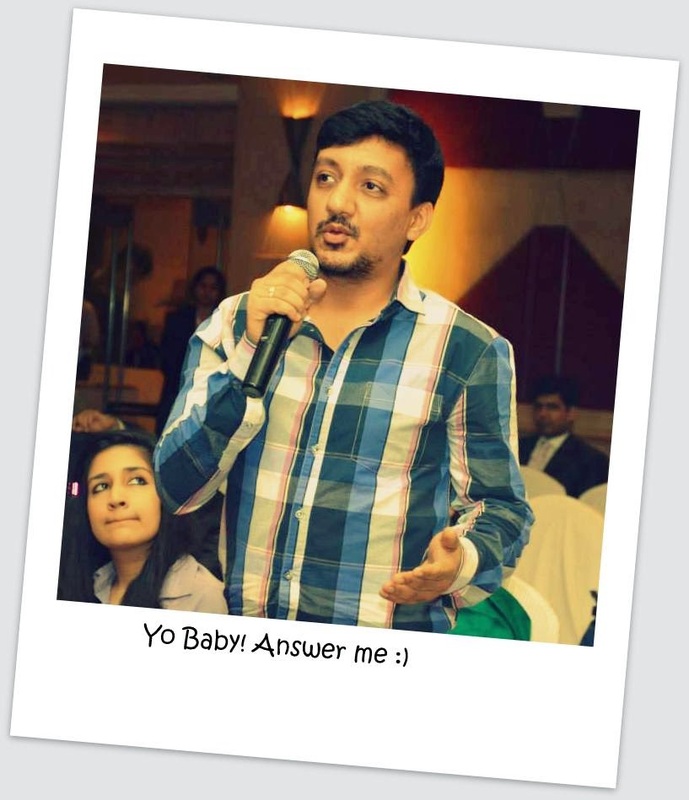 He helps startups to start up, and has founded http://applyifi.com and http://www.thehubforstartups.com. 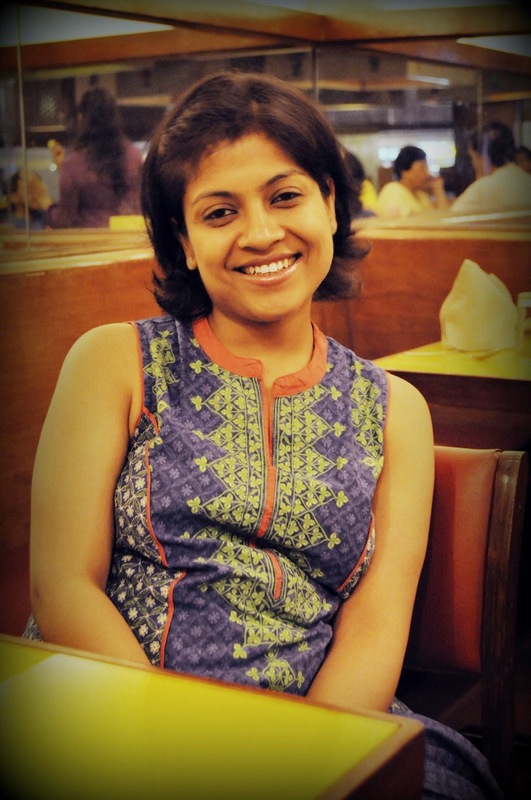 London School of Economics alumnus Swati Bhargava quit her job at Goldman Sachs to start Cashkaro.com - the largest cashback site in India. She also started Pouring Pounds in UK, a B2B business where they set up and manage cashback and voucher websites for large partners. The day ended with a story from the community - of entrepreneurship and transitions by Natasha Badhwar. 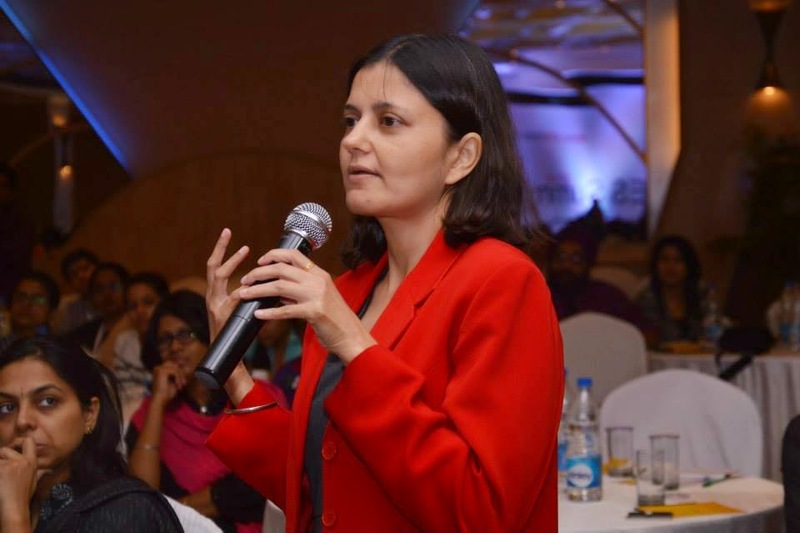 [Natasha Badhwar is a columnist, media trainer, and entrepreneur. She writes on love and relationships in the context of the modern Indian family in her column "My Daughters' Mum" in Mint Lounge. Natasha has worked with NDTV for 13 years and was India's first female news cameraperson. She quit as Vice President, Training and Development. As I was just about to leave the venue, I couldn't help but think about Sadhna yet again. But this time around, I felt hopeful. Not all is lost - for her and million of women like her. Thank you for such a detailed post. Glad you liked the event. Great Coverage Rahul...enjoyed reading it!